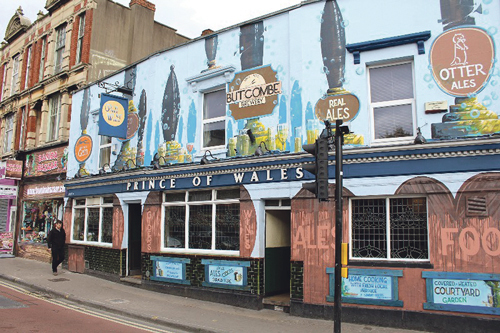 WITH the number of pubs in the UK declining every week, the Prince of Wales on Bristol’s Gloucester Road is a shining example of how an independent pub can still pull in the punters by serving top quality local food, ales, ciders and soft drinks for over a decade. However, the Bristol landmark is now under threat from owners Enterprise Inns, who have plans to turn this much loved hostelry into a company-managed pub – and landlady Anna Gorman is not giving up without a fight! Anna, who has rented the Prince of Wales from the brewery for 15 years, was due to hand back the pub in December last year, but was given a year’s reprieve to fight in the courts to get a new lease for the pub. In 2016, a change in regulations meant that pubs had to get rid of the controversial ‘beer ties’ which forced pubs to buy their beer from the owners of the building, meaning that more of the larger brewery chains started bringing in their own house managers, including Enterprise Inns. Anna has said she will be the first landlord in the country to fight Enterprise Inns on its new stance, and continue to utilise good quality, local produce, including meat from Gloucester Road legend Tom Murray and olives from Spanish hero El Comado. The pub also sells a wide range of beers and drinks from independent brewers and producers, including Bristol Beer Factory, New Bristol Brewery, Dawkins Ales and Bath Ales. The cost of fighting the case could rise as high as £40,000 – Anna has already spent £7,000 on legal fees – and so she has launched a crowd funding appeal in the hope that the local community will get behind her and help her fight for the pub’s right to stay independent. More than £2,000 was given to the pub’s campaign in the first day, but Anna still needs more people to get behind the cause, sign the petition and donate. Says Anna: “I am not taking this threat from Enterprise lightly and plan on being the first landlord in legal history to take the multi-million-pound company to court over my right to keep the Prince of Wales as it is, a traditional local pub for the Gloucester Road community. The Prince of Wales is part of a large collection of independent shops, cafes and restaurants which run along the Gloucester Road. “This independent ethos encapsulated by the Prince of Wales would be at great risk if Enterprise Inns were to introduce their own managed house in place of our beloved local. Enterprise Inns want to forcibly remove me as a tenant from the Prince of Wales and turn it into a managed house run by the Bermondsey pub company. They aim to run a chain of 200 pubs by 2020, replacing individual characterful community pubs with generic chain branding. Anna needs to raise a further £33,000 to continue the fight against the brewery giants. Visit https://www.crowdfunder.co.uk/save-the-prince-of-wales-1 if you wish to donate.